Of course, I was pleased with Justice Harry Blackmun's abortion decisions, which were an unbelievably sweeping triumph for our cause, far broader than our 1970 victory in New York or the advances since then. I was pleased with Blackmun's conclusions, that is. I could not plumb the ethical or medical reasoning that had produced the conclusions. Our final victory had been propped up on a misreading of obstetrics, gynecology, and embryology, and that's a dangerous way to win. In 1973, the first year in which America’s new abortion free-for-all went into effect, there were 615,831 abortions reported by the Centers for Disease Control (CDC). For the next nine years, the annual abortion total increased every year. By 1979, it had more than doubled—finally peaking in 1990 at roughly 1.5 million. It would take another 23 years for the annual U.S. abortion total to fall back below one million. Though 2014 is the most current year for which “official” abortion totals are available, I’ve been projecting my own annual estimates going back to 2009—and those projections have turned out to be fairly close to the Guttmacher Instititute’s final tallies, which come two or three years down the road. The Guttmacher Institute, which is the research and policy organization birthed by Planned Parenthood, is generally regarded as the most reliable source for nationwide abortion statistics. We can thank the state of California for giving Guttmacher that distinction. In 1998, California stopped recording and reporting annual abortion totals, which immediately made the CDC totals grossly incomplete. Maryland and New Hampshire have also ceased reporting, though their omissions have far less impact on the nationwide tally. Guttmacher’s totals, which are generally only published every three years, rely on direct queries of every known and suspected abortion provider in the country. Until this past year, I didn’t realize how much speculation was built into Guttmacher’s U.S. abortion statistics. I thought they were actual counts of actual abortions. It turns out they’re not. In 2014, Guttmacher was only able to get counts from 58% of the abortion providers it contacted, which means their abortion totals for the remaining 42% were estimated or borrowed. Though the Guttmacher statisticians have far more data available to them in the United States than they do when making their global abortion estimates, it’s fair to wonder how much their methodology is influenced by their devotion to elective abortion. Just as the CDC numbers may be hampered by underreporting, the Guttmacher numbers may be hampered by overestimation. 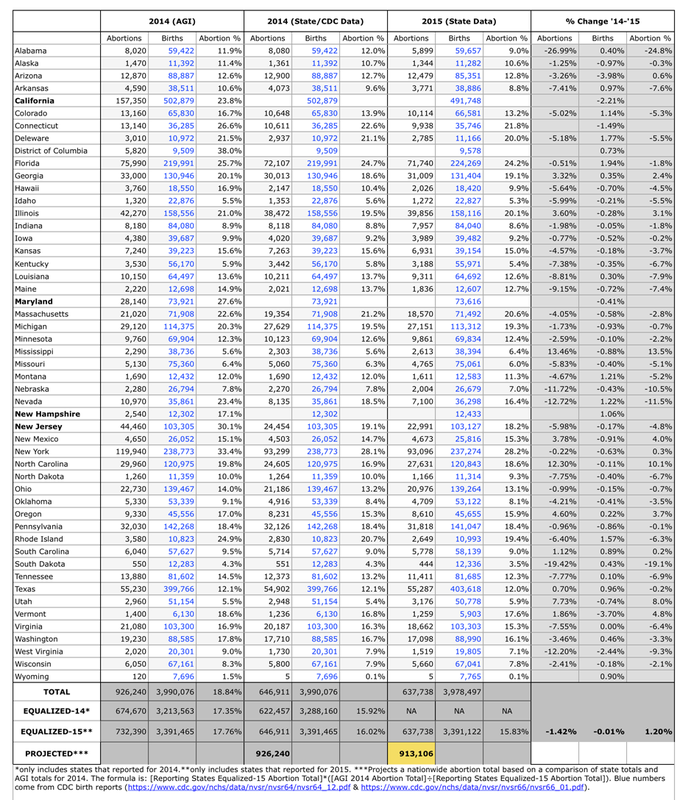 To reach my own annual abortion estimates, I take the published abortion counts from every available state and compare the cumulative total to Guttmacher’s most recent data—which in this case is from 2014. To date, I have obtained 2016 abortion totals for 31 states. In 2014, the combined state-reported abortion total for these 31 states was 41% of the nationwide abortion total estimated by the Guttmacher Institute. Assuming that these 31 states make up the same percentage of U.S. abortions in 2016 as they did in 2014, we can extrapolate that approximately 892,804 U.S. abortions took place in 2016. Let's round it off to 893,000. Last January, I estimated that 906,369 U.S. abortions occurred in 2015. As the year went on, and more states reported, the estimated total rose somewhat. 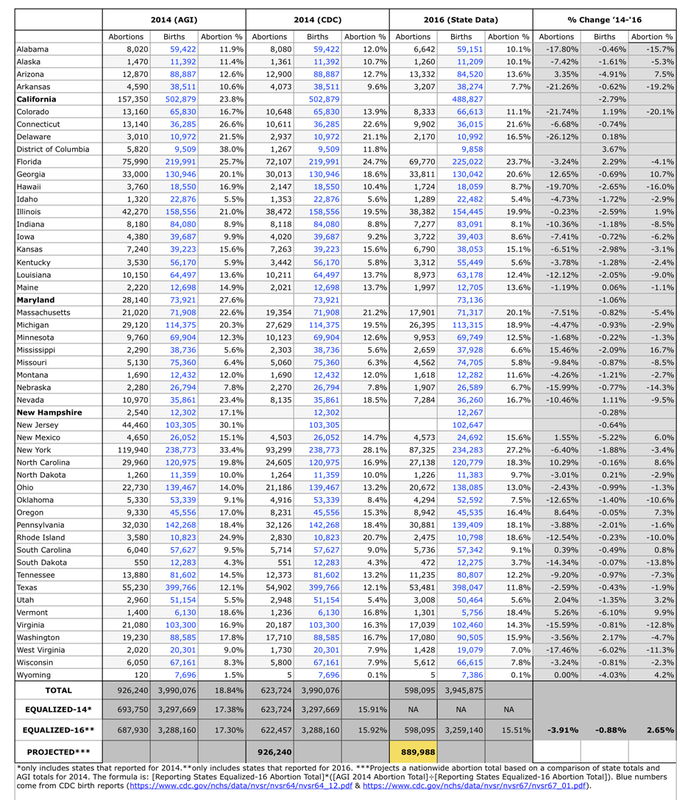 With 43 states now reporting, my 2015 abortion estimate has been amended to 914,417—making the 2016 tally a reduction of 2.3%. The abortion ratio, which is a more important number, fell by 1.9%. These are modest gains for abortion-vulnerable children, but I am grateful that across the country, annual abortion totals continue to fall. That being said, I remind you again that America is not a monolith. The 2016 abortion ratio increased in Alabama, Arizona, Kentucky, Maine, Minnesota, North Dakota, Oregon, South Dakota, and Washington. For those of us who oppose abortion’s continued assault on the most innocent members of the human community, we’re still a long way from where we want to be. So if you count yourself among that number, please consider joining Abort73 as a monthly donor in 2018. Simply believing that abortion is wrong isn’t enough—not by a long shot; we must also be willing to do something about it.